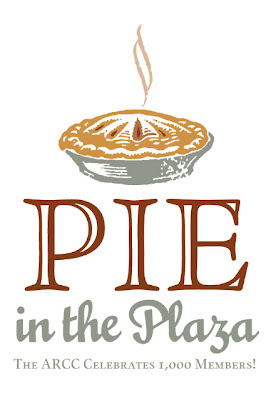 Yesterday afternoon I had an event for work, a little thing called Pie in the Plaza. It was an event I did not conceive, but was appointed to name and market. Sean, ever the dream-come-true-husband, came to my rescue and created a logo for it. I’d say it was free, but I think we can say I have paid for it through enduring the teasing regarding my advanced age (2 years and nine months older). In any case, the logo worked and we had a pretty decent turn out all things considered – These things being pies from a convenience store, an alley as the location, a torn up street as the back drop, and a 3-5pm time making it a work unfriendly schedule. Luckily Briar was there. Between Sean dancing with Avery in the Baby Bjorn and Briar devouring a forbidden artificial ingredient loaded confection, I had a pretty great time.